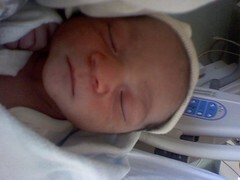 My nephew, Daniel Elijah, was born today June 9, 2008. 7lbs, 6oz, 19.5 inches long. He looks just like his brother, Justin. Mom and dad are doing great. I’ll get more pics when they come home tomorrow.